A lot of people know to rub aloe's sap on a burn; perhaps that's why so many folks recognize it visually. Other plants native to dry environments may seemingly masquerade as different aloes, but are different species altogether. Their growing needs mimic those of aloe: grow them in a frost-free area, don't grow them in wet soil and provide lots of bright sunshine. Also known as century plants, agaves (Agave spp.) resemble aloe plants especially if their leaves are narrow and the plant grows no taller than 12 to 20 inches. Even though the plant is a succulent, agave leaves typically grow more flatly like a speared tongue and the fibrous leaves bear much more voracious spines. An agave tolerates even drier soil and arid air conditions than the aloe, but appreciates soil moisture in the hottest part of the summer. Foxtail agave (Agave attenuata), Parry's agave (Aloe parryi), hedgehog agave (Agave stricta) and the thread-leaf agave (Agave filifera) may visually resemble an aloe. Agave plants die after the flower when mature, unlike aloes. Two groups of bromeliads native to arid regions resemble the aloe. Even their flower spikes look like those of aloe. Dyckia and Hechtia comprise over 150 species of rosette-forming succulents with strappy leaves and sharp teeth, all native to arid regions in the U.S. Dyckia produces a tall flower spike topped in orange to yellow tubular flowers that hummingbirds pollinate. The Dyckia remains perennial, not dying after flowering. Hechtia flowers are creamy white and the plant dies after flowering. Pineapple (Ananas comosus), also a bromeliad, grows into a tall rosette with long, strappy leaves and spines. 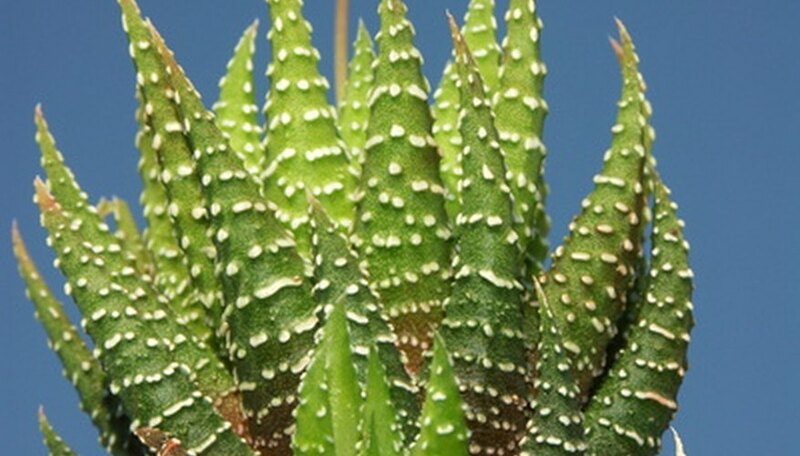 At first glance, you may think it is an aloe until someone reveals this famous fruit plant's name. The pineapple plant bears a club-like flower on a stem that ripens into the golden fruit. If no flower spike or or fruit is present, someone may not readily distinguish this bromeliad from a large aloe. Unlike aloe, pineapple plants die once the fruit develops. Hailing from southern Africa, Haworthia plants look like tiny aloe plants, growing no taller than 3 to 8 inches tall. Their leaves form a rosette and may or may not feel soft and fleshy to the touch. Leaves of two species, Haworthia attenuata and Haworthia fasicata, display zebra-like white markings on leaf undersides. Haworthia tessellata leaves look like pointed lizard tongues that are plump and succulent. These plants do flower, producing tiny tubular or funnel-shaped pink to white blossoms on wiry upright stems. Like aloe, they continue growing after flowering and seeding. Cacti Guide: Cacti or Not? Do Century Plants Die After Blooming?